Take a ride on the wild side! 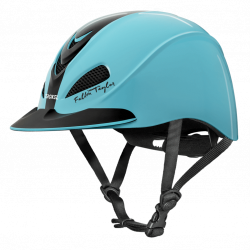 Designed by World Champion Barrel Racer Fallon Taylor, this helmet combines fashionable western graphics with an ultralight low profile design. DialFit System, removable, washable, Flip-Fold liner with air channel technology. Mesh covered vents. Sizing such as Small, Medium, Large, etc. is not the same for different Troxel Styles. XS (6 �-6 �) 19- 5/8" � 20 3/8"
Small (6 5/8 -7) 20 �" - 22"
Medium (7- 7 �) 22"-22 �"
Large (7 1/4-7 3/8) 22 �"-23 1/8"
Xlarge (7 3/8- 7 �) 23 1/8-24 3/8"